On Sunday I went to the 35th Annual Sakura Matsuri (Cherry Blossom) festival at the Brooklyn Botanical Gardens. As cherry trees have held cultural significance for both the U.S. and Japan, both countries have used “Cherry Diplomacy” to promote values and maintain relations abroad. The festival on Sunday was an opportunity for Americans interested in Japanese culture to check out activities including tea ceremonies, manga drawing, origami, traditional dance, drumming, theatre, martial arts, visual arts and even stand up comedy. The event meshed well with the permanent installations of Japanese cherry trees, bonsai tree collection and Japanese-style garden and pond that have been fixtures at the Botanical Gardens for years. What caught my eye were the large numbers of youngsters, Japanese and American who had showed up dressed like their favorite anime characters. 1 out of every 6 people I saw at the festival was “cosplaying” the likenesses of Dragon Ball Z, Cowboy Bebop, Sailor Moon, Spirited Away and more. Looking at the program, I was shocked to see that there was no costume contest and these people had dressed up on their own, Gothamist got some great photos last year. 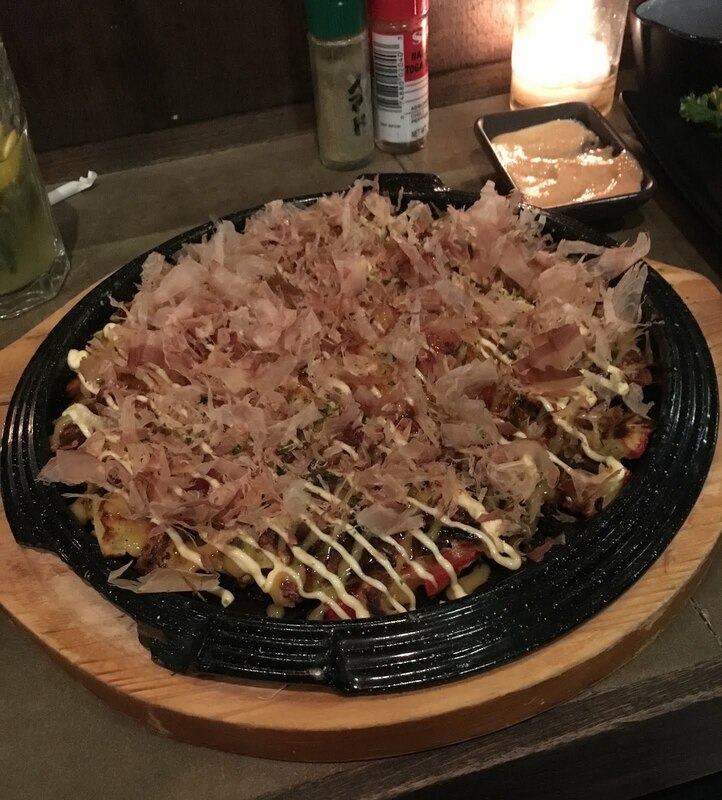 I finally got a chance to taste one of the most popular eats in New York right now: Okonomiyaki. Originating from Okinawa, Japan, it’s a flour pancake with meat/seafood, scallions, veg and sometimes cheese, topped with shredded bonito fish that dances around on the hot plate when it is served. The pancake was bursting with flavor (the extra sauces were a bit much!) and I wished I’d had an ice-cold beer to wash it down. We sat at the bar at Izakaya Nomad and watched the chefs prepping tataki over a grill that they occasionally seasoned with a big slab of fat. Of special mention were the purple sweet potato fries that were in a lighter-than-tempura batter and came with a mentaiko aioli that had been blended with marinated cod roe, really unique. Afterward, we rode our bikes a mile South to Small’s Jazz Club in the Village where we arrived just in time for the 7:30 set. Fukushi Tanaika, one of the most well-known contemporary Japanese jazz artists, was on the skins with his quartet. Joining him were his countryman Hide Tanaka on bass, Texan Marc Devine on piano and Seattlelite Chris Johansen on tenor sax. Their set was an impromptu tribute to Hank Mobley, a tenor sax composer well known for hard bop and soul jazz. The venue is a basement with a small bar and a couple mirrors allowing you to see behind the musicians. The intimate setting was perfect for the quartet, who got everybody in the joint jumpin’ to the beat. It was incredible to have Fukushi gush about how big of an influence Hank Mobley was for himself and Hide while they were growing up in Japan. The existence of the Fukushi Tanaika quartet had to certainly be influenced by some of the U.S. Jazz Diplomacy and VOA Radio that disseminated the uniquely American music around the world during the Cold War years. Colombian superstars, Juanes (aka Juan Esteban Aristizábal Vásquez) and Shakira (Shakira Isabel Mebarak Ripoll) have been selected to sing at the inauguration of the 2010 World Cup this year. The only singers chosen from Latin America will accompany Alicia Keys, Black Eyed Peas and Amadou & Miriam. While this gives Colombia an excellent opportunity to showcase it’s cultural diplomacy on a world stage, I also think that it may have come as a consolation prize due to the fact that Colombia did not make the qualifying rounds for World Cup this year. However, I should add that Colombia’s Women’s Selection recently qualified for the World Cup in Germany, to be later this year, congrats ladies! The comparison Mr. Varela has drawn to the U.S. father of Folk has to do with his musical and lyrical styles, however his recent trip to the U.S. indicates improving cultural ties between the two countries. This comes a week after Kool and the Gang gave a huge performance in Havana, reciprocating cultural exchange that was previously forbidden under the Bush Administration. Having toured with Jackson Browne and been to the U.S. during the Clinton years, Varela was barred from entering in 2004, even after nearly 2000 tickets to his concert in Miami had already been sold. Despite strong words from Presidents Castro and Obama about what each country needs to do policy-wise, the cultural exchange of U.S. and Cuban artists allows for artist-to-artist, artist-to-public and artist-to-politician diplomacy, all laying the foundation for potential policy changes down the road. la gente espera algo, pero aquí no pasa nada. Un tipo gritó: ¡sálvese quien pueda! Cada día que pasa sube más la marea. están a 90 millas de la mía. la política no cabe en la azucarera. (Policy does not fit in the sugar bowl). Never have I seen someone enjoy themselves on stage like Manu Chao and his band. He seems to let the music take him to a place only performers like Bob Marley and Marvin Gaye seem to have found while on stage. I will admit that many the songs sounded a bit similar (reggae/folk with punk/ska breaks), making the concert at times sound like one long Manu Chao song. But I’ll give it to him, the man knows his audience and he knows how to work ‘em. From a Public Diplomacy perspective, it’s remarkable to see how a Parisian who also claims Barcelona as home can have such a powerful influence in Latin America. While he does have Peruvian heritage, his credibility is enhanced by his songs’ focus on indigenous movements and against foreign exploitation in Latin America. Singing in 4 languages (French, Spanish, Portuguese, English), is another way he has been able to win over Latin American publics. While Manu’s “Third World Solidarity” may not have as large an impact in Euro-centric Argentina, he was able to make time for announcements from two Argentine civil society groups during the concert. He closed out the show by bringing them all back onstage for a 30-minute encore, praising the Pachamama (Mother Earth).